Zoinks! LED’s are back in the news ! Check out the article below! General Electric, the granddaddy of light bulbs, has developed an LED replacement for 40-watt bulbs that can last for 17 years. GE on Thursday unveiled the Energy Smart LED bulb that puts out 450 lumens–about the same output as a 40-watt incandescent–while consuming 9 watts. GE’s bulb is designed to disperse light more evenly than typical LED lights. (Credit: General Electric) The company plans to show off the LED bulb at upcoming lighting conferences and to start selling it by this fall or early next year. It ios expected to cost $40 to $50. LED lights tend to give off light in a specific direction, which is why they are often used for spot lighting. 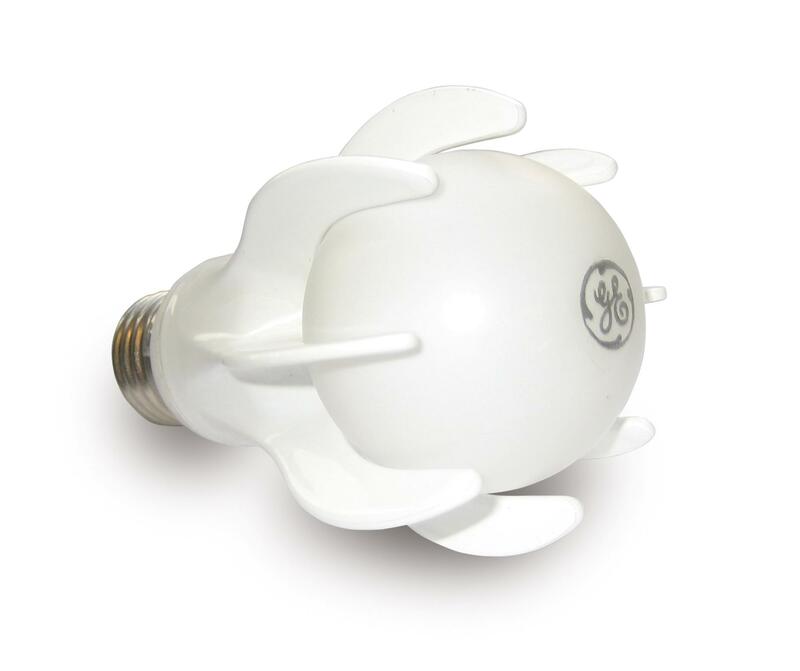 The GE light has a shape that looks like fingers wrapped around a traditional bulb and is designed to disperse light. Prototypes of the bulb will be fitted with an LED lamp from LED component manufacturer Cree. The bulb is rated for 25,000 hours which, if used four hours a day, means it will last for 17 years. The other advantages of LED bulbs are that they don’t need to warm up to give off full light, are cooler than incandescent or compact fluorescent bulbs, and do not contain mercury. “This is a bulb that can virtually light your kid’s bedroom desk lamp from birth through high school graduation,” John Strainic, global product general manager of GE Lighting, said in a statement. He added that the bulb is designed to satisfy consumers who are reluctant to move from incandescent bulbs because they like the light quality. Because of their relative energy efficiency and durability, LED lights are expected to start replacing other technologies more rapidly this year, particularly in commercial settings. As LEDs reach the output of 40-watt and 60-watt incandescent, lighting companies are also planning general-purpose LED replacements for traditional screw-in bulbs. Osram Sylvania, for example, plans to introduce an LED replacement for a 60-watt incandescent this spring. The high up-front cost, however, remains a barrier to broader adoption. Lighting manufacturers expect that sales will be driven by consumers’ interest in efficient, long-lasting bulbs and by more stringent national efficiency standards. Gad-ZOInks! It me Dr Z. grandpoobah of the Lighthouse. I included a a wonderful article on the inventor of spiral fluorescent, Ed Hammer. One of my personal heros. Enjoy! Cheaper LEDs to light a green path? January 19, 2007 Consumers with an eye to conserving energy may be snatching those swirly compact fluorescent bulbs off store shelves now, but 30 years ago they were barely a shade away from crazy. Critics said it couldn’t be done. could light a room. Instead, increasing energy costs have made Hammer’s invention a quickly growing part of the consumer market. Household CFLs operate on 13 to 25 watts of energy, far less than 60- to 100-watt incandescent bulbs, and thus have become a favorite with consumers trying to curb energy costs. The bulbs also last far longer than standard incandescent bulbs. Although the bulbs contain mercury and thus aren’t supposed to be thrown away with the regular trash, sales are climbing. Sales could climb further if legislation pending in various jurisdictions banning incandescents passes. CFLs will face heated competition with light-emitting diodes, but right now the price of LED lights is fairly high. GE assigned Hammer to work on energy efficient bulbs at its labs in Nela Park, Ohio, during the first U.S. energy crisis in the mid-’70s. His first invention was a standard-shaped 40-watt fluorescent lamp, called the F-40 Watt Miser, in 1973. To lower the power consumption, Hammer changed the gas used and tweaked various components inside the lamp. Next came the CFL. Bulbs and fluorescent light, however, are not a natural combination. Fluorescent lights are ordinarily tube-shaped. Curving them into a bulb shape creates reflective losses, i.e. light that shines from one part of the tube gets deflected by a nearby spiral. Through a lot of trial and error, he came up with a way to space the spirals far enough apart to minimize losses without also losing a bulb-like shape. Many manufacturers have tried different designs, but the shape Hammer coined remains dominant. Hammer invented the bulb in 1976, he said, and primarily worked alone. (Editor’s note: the years reflect the time Hammer says he invented the bulbs, not when GE announced them.) The original prototype is in the Smithsonian. Although executives at GE liked the idea, they decided not to market it at the time. CFLs would require entirely new manufacturing facilities, which would cost $25 million. “So they decided to shelve it,” Hammer said. The electronics giant contemplated licensing the design. Unfortunately, the design leaked out. Others copied it before GE started a licensing program. Hammer hasn’t done badly either. He has published more than 40 papers and was awarded the Edison Medal by the Institute for Electrical and Electronics Engineers in 2002.